The Belize Tourist Board has announced its sponsorship of the 1997 San Pedro International Sea & Air Festival by pledging to provide Santino's Messengers and Andy Palacio to headline Belize Night. Festival co-chairman Eiden Salazar Jr. is working to line up a well known Caribbean entertainer to highlight the Belize Night Extravaganza. Ramon's Village Resort has generously offered to provide accommodations for the five contestants and their chaperons for La Reina de la Costa Maya Pageant. The sashing ceremonies for the event will be held poolside at the resort. Coral Cable Television, a division of Pete's Enterprises and the San Pedro Sun have committed to sponsorship for the fifth year. The two companies provide advertising coverage for the festival. Einer Gomez, hotel chairman of the festival reported that a letter has been sent to all local hoteliers requesting a donation of 10% of their rooms to accommodate visiting entertainers. Gomez said that the response has been good. The committee is actively seeking support and sponsorship by donations of rooms and services to assist in staging the festival as they have no start-up funding. Letters were sent to the bar owners who purchased liquor booths last year. They will be given the first option to purchase one of the four liquor booths that will be available for the 1997 Festival. Anyone interested in purchasing a booth should contact Einer Gomez at Ramon's Village. The Sea & Air Festival committee meets every Tuesday night at 7:30 p.m. in the courtyard of Paradise Resort, volunteers are welcome and needed. 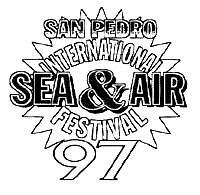 The San Pedro International Sea & Air Festival committee is extending an invitation to artists in Belize to assist the festival by designing a logo for the 1997 festival banners and t-shirts. In past years the festival logos have been designed by island artists. Johnna Pearly Trejo created the first logo in 1992 and it was used again in 1993. In 1994 Norman Gosney's logo was emblazoned on the banners and shirts. Walter Castillo's "Village Life" appeared on the 1995 shirt and in 1996 Giovanni Marin's depiction of the five Mundo Maya countries was the festival's symbol. Logos should be sent to Chairman Gach Guerrero at the Sea and Air Festival office downstairs at the San Pedro Town Hall. The deadline for entries is June 6. In addition to recognition the artist whose logo is selected will receive 2 season passes to the festival.